Peppa Pig delights little fans across Melbourne theatres. 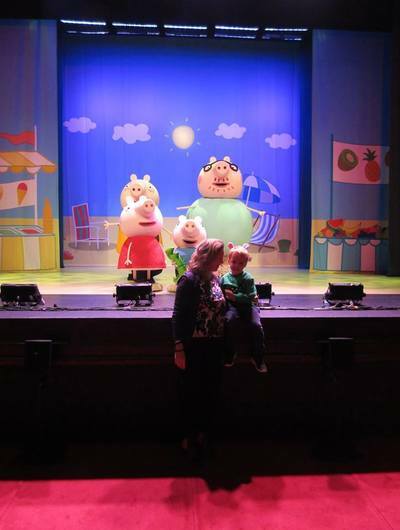 Peppa Pig's Surprise is the newest theatre show based on the much-loved TV show. The tour recently toured theatres across Victoria before trotting off to NSW. We saw Peppa Pig's Surprise at the Comedy Theatre in Melbourne, much to the delight Peppa's biggest fan ..in our household! Peppa Pig's Surprise is a sweet theatre performance for all little pig fans, filled with some of the best scenes previously seen in Peppa Pig's TV episodes. The show is an hour duration without an interval, and is therefore just right for mini theatre goers. The theatre show has a presenter, Daisy, who introduces each scene and very much gets involved with Peppa's adventures. Daisy is played by Emma Arends and is a 'real person' in the show whereby Peppa, George and her friends are life-sized puppets. Daddy Pig and Mummy Pig however, arrive on stage in huge larger-than-life costumes, much to the delight of the audience! The story revolves around Peppa Pig and her family planning to visit the "seaside". Before doing so, the two piggy siblings follow their bath and bedtime routine the night before. There's plenty of mad-cap fun to entertain little ones along the way, with water squirting into the crowd and bubbles too. Kids in the audience join in with familiar sing-a-long songs (the Bing-Bong song! ), and as the name suggests, there are lots more little surprises along the way, including a beautifully hypotonic underwater scene! Peppa Pig's Surprise is a lovely introduction to children's theatre. Take your kids if you can, book via peppapigliveaus.com.